Citation Information: JCI Insight. 2017;2(15):e93834. https://doi.org/10.1172/jci.insight.93834. Organ-specific patterns of myeloid cells may contribute tissue-specific growth and/or regenerative potentials. The perinatal stage of pancreas development marks a time characterized by maximal proliferation of pancreatic islets, ensuring the maintenance of glucose homeostasis throughout life. Ontogenically distinct CX3CR1+ and CCR2+ macrophage populations have been reported in the adult pancreas, but their functional contribution to islet cell growth at birth remains unknown. Here, we uncovered a temporally restricted requirement for CCR2+ myeloid cells in the perinatal proliferation of the endocrine pancreatic epithelium. 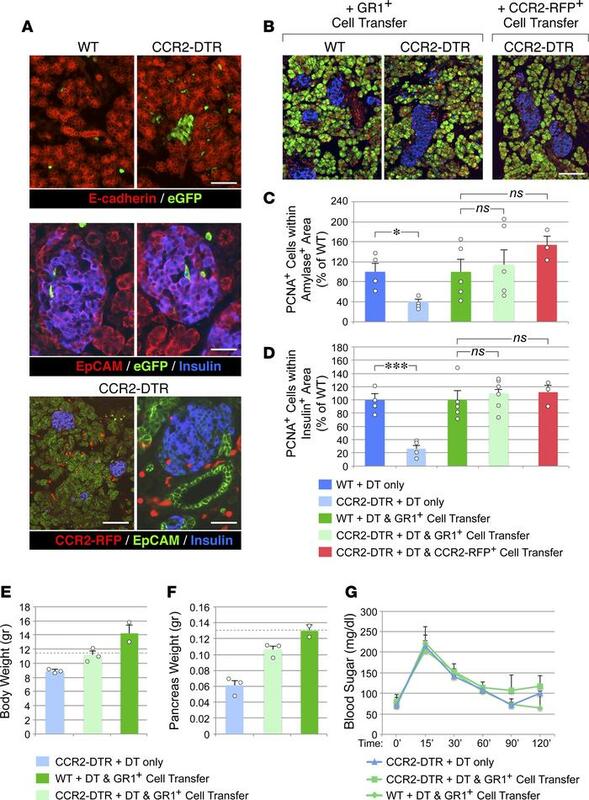 CCR2+ macrophages are transiently enriched over CX3CR1+ subsets in the neonatal pancreas through both local expansion and recruitment of immature precursors. Using CCR2-specific depletion models, we show that loss of this myeloid population leads to a striking reduction in β cell proliferation, dysfunctional islet phenotypes, and glucose intolerance in newborns. Replenishment of pancreatic CCR2+ myeloid compartments by adoptive transfer rescues these defects. Gene profiling identifies pancreatic CCR2+ myeloid cells as a prominent source of IGF2, which contributes to IGF1R-mediated islet proliferation. These findings uncover proproliferative functions of CCR2+ myeloid subsets and identify myeloid-dependent regulation of IGF signaling as a local cue supporting pancreatic proliferation. Reconstitution of CCR2+ myeloid pools by DT-resistant CCR2+ cells rescues pancreatic epithelial proliferation. (A) Pancreatic sections from DT-treated mice reconstituted with GFP+GR1+ cells, stained for E-cadherin or EpCAM (red), insulin (blue), and GFP (green). GFP+ cells populate epithelial exocrine and endocrine clusters. Pancreatic sections from DT-treated CCR2DTR/+ mice reconstituted with CCR2+ cells from CCR2WT/RFP mice showing CCR2-RFP+ cells (red) throughout the pancreas, including islet structures, identified by EpCAM (green) and insulin (blue) immunoreactivity, respectively. Representative of n = 6 experiments. (B) Pancreatic sections of P10 DT-treated mice rescued with GR1+ cells or sorted CCR2-RFP+ cells, stained for PCNA (red), amylase (green), and insulin (blue). Representative of n = 3 experiments. Scale bars: 50 μm (A); 100 μm (B). (C and D) Morphometric analysis of proliferating PCNA+ cells detected within amylase+ (C) and insulin+ (D) areas (mean ± SEM of 3–5 mice per group). *P < 0.05, ***P < 0.001, 1-way ANOVA nonparametric test, followed by Bonferroni post-hoc test. (E and F) Body and pancreatic weights of rescued and not rescued CCR2DTR/+ mice and controls, followed up to 4 weeks of age (mean ± SEM of 2–3 mice per group; dashed lines represent average body and pancreas weights of untreated age-matched WT controls). (G) Glucose tolerance tests of the mice in E and F after 16 hours of fasting, showing normal glucose tolerance.